The AI-900 provides a complete communication network throughout a facility or campus, and can be easily integrated with access control and video surveillance systems. In today's world of heightened security, and with a variety of application needs, a system needs to be flexible and versatile. Simple programming of the Al-900 allows each system to be custom-configured to meet the specific needs of almost any commercial or institutional application. Whether the person on duty is in a security office or is making rounds, a call from a remote area never has to go unanswered. The Al-900 is a sophisticated yet simple system that meets the demands of today's corporate and institutional facilities. Aiphone's AI-900 Integrated Security Intercommunication System is a voice communication system that allows calls to be made quickly and easily—even in emergency situations—with the touch of a button. 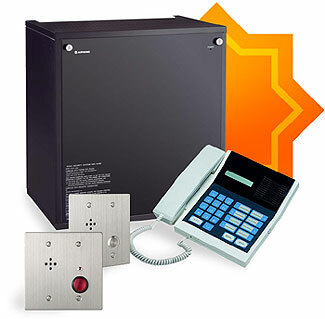 The Al-900 system's ability to integrate with other systems makes it ideal for security applications.